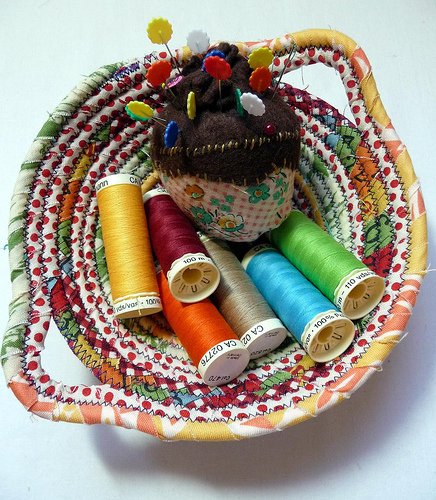 So remember how you all asked for a tutorial on those fabric bowls? And I kicked and screamed and said “No, I’m busy?” Well, I finally made one and posted it up at Craftstylish. Enjoy! I actually wish I had some more clothesline to make more right now. Um, not that my pile of them is dwindling, even after some of them went out for Christmas. But they are so seriously relaxing to make. And thanks to everyone for your sweet comments. It really helps to know that people are thinking of us, and I know my sister has been pretty wowed by how nice you all have been. Please keep Jasenn in your thoughts and prayers. Thank you. As Jessica said, I couldn't figure out how to leave a comment on your latest post, but I wanted to express my condolences. I couldn't comment on the memoriam post but just wanted to convey to you and your family how sorry I am for your lost. This was the post that we all hoped would never come and you guys are in my prayers. Be comforted by the love that we're sending you through the blogosphere! Linda - thanks for the encouraging comment that you left on my blog today. I really appreciate. I'm sorry that you and your family is having such a tough time lately. You're in my thoughts as well!!! oh my gosh, HOORAY! thank you for doing that-- i actually bought some clothesline a few weeks ago *hoping* one day you'd do a tute on these. my impulse craft shopping has been justified. can't wait to make one! I am seriously going to have to try this! It does look very addictive!